"It means a lot knowing that we're both public servants," mom said. 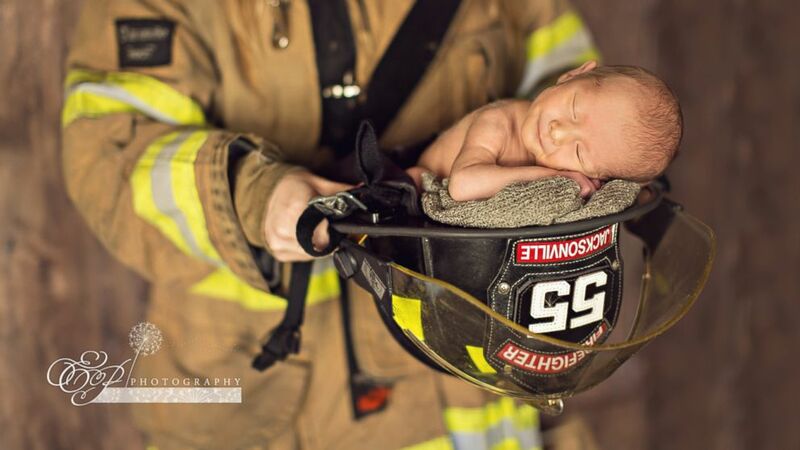 A baby has celebrated his parents in an adorable photo session by honoring their civil service professions. Enzo Anthony Crnolic, 1 month, was captured posing with his mom's firefighter hat and dad's policeman cap. Both of Enzo's parents serve in Jacksonville, Florida. 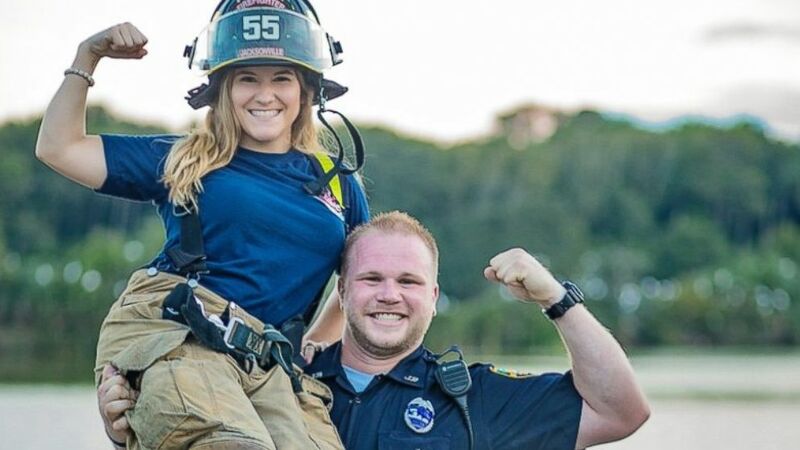 "It means a lot knowing that we're both public servants and I wanted to do a photo that included both him as a police officer, and me as a firefighter," said mom Caroline Crnolic, 27, a firefighter for the Jacksonville Fire and Rescue Department. "We keep saying Enzo's famous now." (Appleseed Photography) Mirza Crnolic, 31, a police officer with the Jacksonville Sheriff's Office in Jacksonville, Florida, seen with his wife, Caroline Crnolic, 27, a firefighter for the Jacksonville Fire and Rescue Department, in an undated engagement photo. (EP Photography) Enzo Anthony Crnolic, 1 month, posed for a newborn photo shoot with his mom's firefighter hat and his dad's police cap. 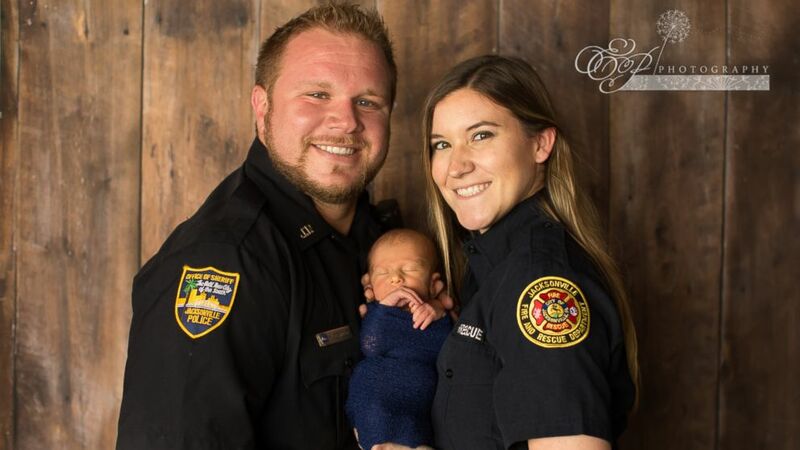 The photos were shot by EP Photography when Enzo was 9 days old, but just Tuesday were shared by the Jacksonville Sheriff's Office, where dad Mirza Crnolic has served for nine years. "I love it," Crnolic, 31, told ABC News of the photo shoot. "It represents both our careers and hopefully he'll choose the best one of those two." (EP Photography) Baby Enzo's mom, Caroline Crnolic, 27, is a firefighter for the Jacksonville Fire and Rescue Department and dad Mirza Crnolic is a police officer with the Jacksonville Sheriff's Office in Jacksonville, Fla.
Enzo also posed with his parents, who were both dressed in uniform, and inside his mother's firefighter helmet.